Book Adventures: Children's Book Week GIVEAWAY Hop! Yay! 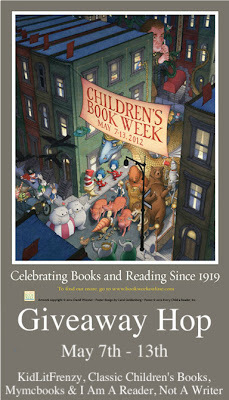 It's Children's Book Week! Click the image to visit all of the other blogs on the hop. Enter the form below for a chance to win an autographed ex-library copy of It's A Spoon, Not A Shovel by Mark & Caralyn Buehner! This book offers a hilarious, multiple choice take on manners featuring several wild animal families. Seriously, this book is so fun to both read and look at the pictures. Also, don't forget, if you live in or near Provo, UT, the Provo City Library is celebrating Children's Book Week all week with THREE different events (5/8, 10, & 12)! Visit the Provo Library's page for more information. 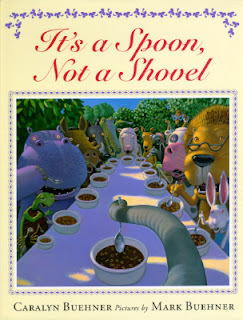 So begins the text of this delightful book about table manners, It’s A Spoon, Not A Shovel. Along with characters such as Victor Vulture, Marty Mouse, or Walter Warthog children can choose just the right response for each situation, then check their answers by finding the same letter in the illustration. I always like the Amelia Bedelia books. I love the Bernstein Bear collection and Dr. Seuss!!! PS Your icons are like the cutest things EVER. Llama Llama Mad at Mama!